Scientists at MPQ produce an extremely cold gas of organic polar molecules. The study of ultracold molecules is a science of its own. Ultracold molecules provide the possibility to investigate fundamental chemical processes or to explore physics beyond the standard model of particle physics. The only snag is the fact that molecules are very difficult to cool down to really low temperatures because of their manifold vibrational and rotational states. A team of scientists led by Dr. Martin Zeppenfeld from the Quantum Dynamics Division of Prof. Gerhard Rempe at the Max Planck Institute of Quantum Optics in Garching has now made a virtue of necessity: the so-called optoelectrical Sisyphus technique, developed in the group, exploits the polarity of formaldehyde molecules, while reaching temperatures as low as 420 micro-Kelvin. 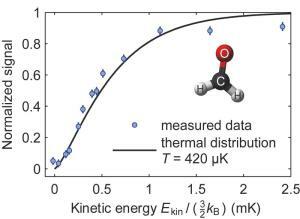 As a result of the cooling process, not only the temperature but also the entropy - a measure of thermodynamic disorder - of the gas is significantly reduced. The system thereby approaches the regime where it has to be described by the laws of quantum physics. "We have reached a point where we can proceed with further experiments that will lead to new fundamental insights into the behaviour of molecular many-body systems," Professor Rempe says. "For example, we envision the investigation of collision processes or of molecular spectra. These are of particular interest because formaldehyde plays a key role in chemistry in interstellar space." The central part of the experiment is an electrostatic trap, made of two capacitor plates spaced by three millimetres. The plates are covered by microstructure electrodes between which high voltages are applied. The resulting potential is similar to a &apos;bath tub&apos;, with a small homogeneous field in the centre of the trap and a steep rise of the field at the edges. A cloud of formaldehyde molecules (H2CO), precooled to less than 1 Kelvin (minus 273 Grad Celsius), is loaded into this potential. The mechanism of the subsequently applied relatively new cooling technique relies on the fact that these molecules exhibit a permanent electric dipole moment (i.e. the negative charge is shifted towards the oxygen atom). Depending on the orientation of its dipole with respect to the electric field a molecule is either strongly trapped (anti-parallel orientation), weakly trapped (inclined) or, in the case of parallel alignment, not trapped at all, which means that the molecule gets lost. Inside the trap the particles climb up the potential hill at the edges until their kinetic energy is almost completely converted into potential energy. At this point RF-radiation changes the dipole orientation of a particular molecule into a more weakly trapped state. (The RF-radiation is only resonant to transitions in the high electric fields that are prevalent at the edges of the trap.) As this state corresponds to a lower potential energy, the particle regains a smaller amount of kinetic energy when it rolls back into the centre of the trap (see figure 1). Repeating this process requires the molecule to be brought back into the strongly trapped state once it has reached the bottom of the trap. This is done by exciting the molecule, by infrared laser light, into a vibrational state that spontaneously decays into the ground state. During this transition the dipole possibly flips back into antiparallel alignment. "The rate of the cooling procedure depends on the rate of this spontaneous decay. In particular it is very important that it proceeds much faster than the transition induced by the RF-radiation," points out Alexander Prehn, a doctoral candidate on the experiment. "Each time the cycle is repeated the molecules loose kinetic energy; and because they have to climb up the potential hill again and again, the method is named after the Greek hero Sisyphus." A timespan of about 50 seconds (15 to 20 cycles) is sufficient to cool the molecular cloud down to a temperature of around 420 micro-Kelvin. To determine the final temperature distribution, a series of measurements is performed where the ensemble is irradiated with radio waves of a different frequency each time. All molecules that can mount the potential hill up to a certain height (which depends on the frequency) or above are transferred into non-trapped states and get lost. The remaining molecules of lower kinetic energy are counted. This way a distribution of the kinetic energy can be deduced (see figure 2). That way the team has produced the largest ensemble of ultracold molecules ever and has thus set a new record. In addition, by applying the right kind of infrared and microwave radiation, they make 80 percent of the molecules end up in the same internal rotational state. "It is of great importance that during all these cooling steps the entropy of the ensemble has been reduced," Martin Zeppenfeld, leader of the project, points out. "With the help of optoelectrical Sisyphus cooling we have increased the phase-space density by a factor of 10 000 which proves the usefulness of the technique. The final state stands out due to its greatly reduced thermodynamic disorder. This provides the possibility to investigate collisions between the molecules or, in future experiments, to explore collective quantum many-body phenomena. New perspectives also exist in the field of spectroscopy." "Laboratory experiments with formaldehyde at low temperatures are particularly interesting since formaldehyde plays a key role in chemistry at low temperatures in interstellar space. It is regarded as a fundamental building block of all more complex organic compounds." Martin Ibruegger, a doctoral candidate on the experiment, adds. The cooling method can be applied to different molecular species, and it could be further improved to reach even lower temperatures. "As one of the next steps we can also try to continue with other cooling techniques such as evaporative cooling. This should allow the nano-Kelvin regime to be reached which is necessary for the formation of a Bose Einstein Condensate." Rosa Gloeckner, a doctoral candidate on the experiment, explains. "Our result is thus an important step on the way to producing quantum-degenerate gases made of poly-atomic molecules." Optoelectrical Cooling of Polar Molecules to Submillikelvin Temperatures.